Does Fellowship Square-Mesa, Inc offer the following services? The Oasis at Fellowship Square-Mesa offers our residents independence and privacy in spacious one bedroom or studio apartments within view of the beautiful Superstition Mountains. I am the second generation in my family to live here. In my opinion, this is the best place in the Valley. They provide everything you could possibly need and much more. My friends are always happy to visit and eat in our dining room...the food is excellent and very healthy. There are many activities and events for your enjoyment. Mom moved into Fellowship Square in 2002 and lived there as long as her health permitted, until 2012. We loved the people, dining room, the care so much we just moved my husbands mother in. Thanks for your dedication to seniors. The love is deeply felt. Beautiful grounds and buildings, with landscaping, a small fountain and pond, and a outdoor pool. 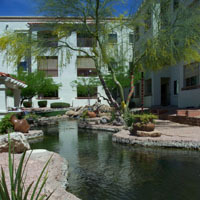 Wonderful location for both independent living for seniors as well as some assisted living places as well. The on-site dining room and cafe, the convenience store, the meeting and craft rooms all are added bonuses.